The wait is finally over for lovers of romance fiction (no pun intended). Today, Monday December 15th 2014, Nigerian publisher Cassava Republic launched their new romance imprint, Ankara Press with six new e-books. I've been following the launch of this new imprint since July, when it was mentioned at a panel on genre fiction at AfricaWrites 2014. There, Bibi Bakare Yusuf, spoke about the creation of Ankara Press - a romance imprint with more of a mass appeal. Ankara Press, however, has been years in the making - with call for submissions back in 2011. Well, it seems like it was worth the wait with the 6 e-books being released today and all available to download now for NGN500 (less than £2). 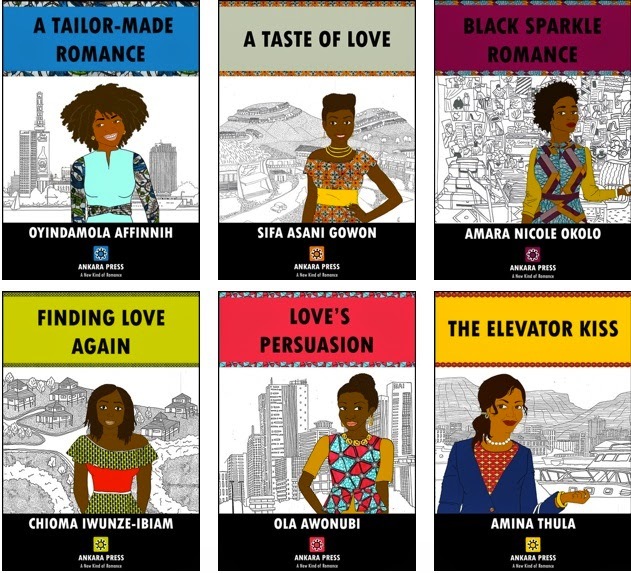 Ankara Press also joins a list of other imprints from publishers on the continent who focus on African romance fiction, such as Nollybooks and Sapphire Press in South Africa and Drumbeats in Kenya.